“The existential imperative creative hyper-personal protocol,” Pete was apt to say as a salutation, always followed by the standard “How’s everything, José?” One look at the white-haired, cummerbund-donning, red bowtie-wearing Pete, a Brooklyn original, and everything was indeed all right. How could it not be? He was a loving man with a smile on his wrinkled mug and a sparkle in his bright eyes. Pete was ready to serve and always ready to impart advice. Our laugh-choked chats were punctuated by the cracks of bowling balls against pins and the gruff barks of the announcer, Theresa, behind the main desk. Crater-faced, pinkie-ring–wearing Tommy would regale us with tales of gunfights at local restaurants. Pete would pull out his manila envelope of philosophical brainstorms, which were often sketched on napkins or aging sheets of graph paper. The man with his endless soliloquies was a force of positive energy, even if there were topics better left alone in Sunset Park. The neighborhood’s dark, seedy days were a touchy subject. “I’ve lived here a long time, my friend,” Pete would say. 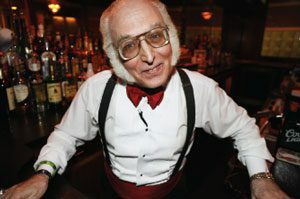 “Decades as a bartender have shown me things I don’t want to share.” Sometimes, there would be conversations that trailed off. “I know a guy … there was a knife … toss this back with me.” Our foreheads would meet. Liquor would flow. 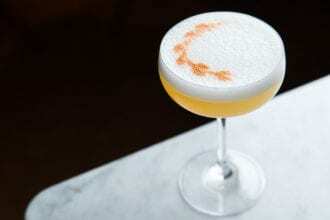 Vodka, honey, lemon and orange flower water strike a delicate balance.